FromSoftware are easily one of the most revered developers right now. Gaining popularity for their more recent games in the form of the ‘SoulsBorne’ franchises, director Hidetaka Miyazaki and his team have become incredibly well-known for crafting dark, rich experiences rife with excellent pacing, world building and level design. True to form, the Japanese studio have gone on to create Sekiro: Shadows Die Twice, a game that takes everything they’ve learned from their previous efforts and represents a finely tuned experience full of beauty, hostility, grace and quality. Sekiro: Shadows Die Twice sees the player assume the role of the One-Armed Wolf, an apprentice shinobi taken in by a great shinobi named Owl. It follows the Wolf’s tale as he has sworn to protect a child named Lord Kuro, who has been born into a lineage known as the Dragon Heritage. Nefarious types in the war-torn land of Ashina are after Lord Kuro and his blood, for it retains restorative properties and grants immortality. Such an effect can be seen in the One-Armed Wolf himself, as Lord Kuro blesses him with the power of immortality. With this in mind, the young Wolf will stop at nothing to keep to his Iron Code and protect Lord Kuro at all costs. In terms of story and writing, Sekiro is a very different game to Miyazaki’s previous creative endeavours. Rather than using the world to tell a story that has already happened, Sekiro features a much more linear and direct story. There are of course multiple endings in line with other Miyazaki games, but the general story itself remains a consistent experience, and is one worth going through. Early on, the game’s pacing can make it feel very familiar, but once you reach the top of the Ashina Castle the direction and plot take hold and the game really begins to shine. If nothing else, Sekiro: Shadows Die Twice tells a compelling tales of loss, sacrifice and loyalty. 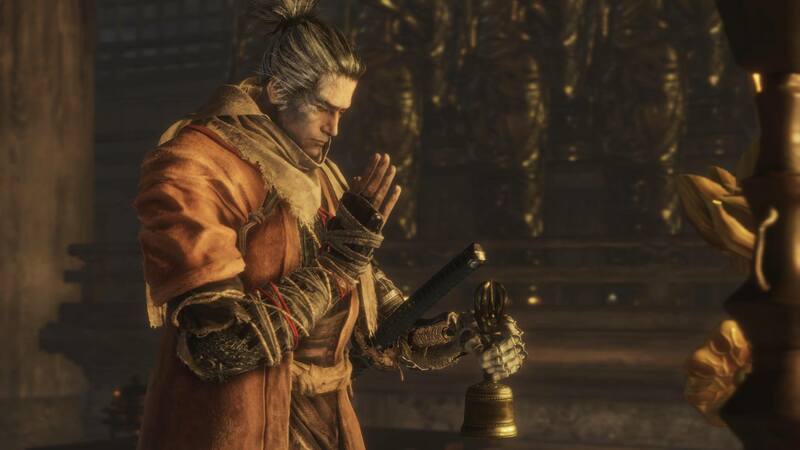 The new approach to storytelling isn’t the only thing that Sekiro does differently to FromSoft’s recent games, there are a lot of changes and shifts in the game design that make it feel both familiar and unique. The folks over at FromSoft have taken some great design aspects from the likes of Nintendo’s The Legend of Zelda games to create a great experience. Things like prayer beads (which are functionally the same as heart containers from Zelda) are great changes which are also intentionally crafted to help stop the exponential power climb that the SoulsBorne games had (whereby it was not hard to make yourself overwhelmingly powerful in comparison to the enemies you had to face). Actually, a lot of Sekiro’s design can be compared to the Zelda games. Even smaller things like the merchants, who are static in their location but always provide useful items for the area that they are in, are fundamental changes to FromSoft’s normality that create a distinct world and experience. Sekiro’s general gameplay is very, very solid. Offering mechanics seen in many contemporary games like a grappling hook and the ability to hang from ledges, FromSoftware have made traversing a very vertical environment built way up in the mountains of Japan quite an exhilarating endeavour. It is by no means difficult to navigate the world, but just making your way around is fun in its own right. Do you aggressively grapple onto every anchor point? Do you sneak your way through, capitalising on the ledges that you can hang from and the long grass that you can hide in? It’s all up to the player on how to approach each different environment. Climbing up the roofs of a tall Pagoda while also trying not to alert all of the people nearby that could ruin my day made for one of the most interesting and exciting experiences I have had in a long time. One aspect of game design that the people at FromSoft have really built on is the combat. Sekiro features a combat system that will feel quite familiar to veteran fans. The basic principles are still in play, however fundamental changes have been made that not only pay respect to how traditional Japanese sword fighting works in real life, but also keep players on their toes. Noticing that players of Dark Souls III were able to simply slash their way through everything, the designers at FromSoft have implemented a guard system called ‘Posture’. This system can be viewed as a stamina bar in some respects, but given that you can endlessly swing your Katana, I wouldn’t really call it as such. Each enemy you encounter in Sekiro will be able to more or less reliably defend themselves against incoming attacks, and this can make damaging them a bit of a challenge. Your job as the player then, is to break their posture, forcing an error and leaving them open for a Deathblow (something akin to a glory kill from DOOM). You need to use a mixture of offensive and defensive tactics to break an enemy’s posture, and this won’t always be easy. Sometimes you’ll need to try and get in a quick hit or two on an opponent first to damage their vitality, as the less vitality you have, the slower your Posture recovers (this works for both you and the AI). Learning when and where to use certain tactics is key to making it through the harsh, beautiful experience that is Sekiro. Sekiro features a very linear power progression system that allows you to dictate the skills and abilities you have, but not really how powerful or potent they are. 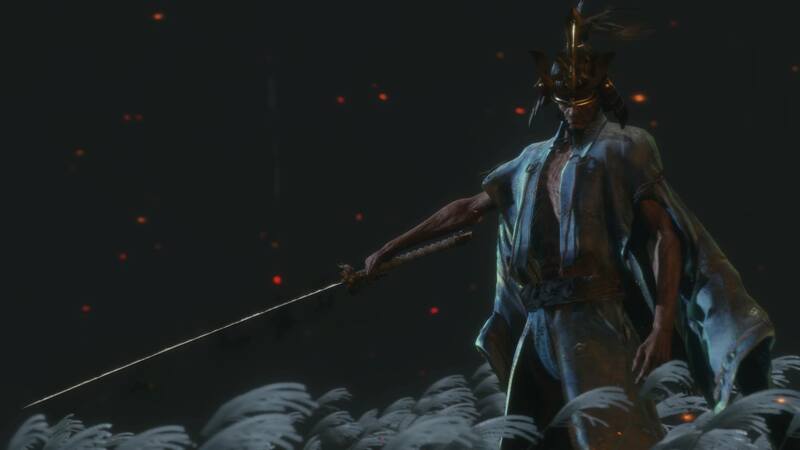 You do upgrade your power as you progress through the game by way of ‘memories’, which are obtained through defeating the various bosses that Sekiro’s world has to offer. Outside of this very linear path though, there is not a whole lot of customisability, which is actually a good thing. It means that the pacing of the game’s difficulty is a very consistent one and you’re not able to kill every boss you see in practically one or two hits (I’m looking at you, Dark Souls OP sorcery build). The only thing that really varies are the Shinobi Tools. These are basically secondary weapons and items that can be used to assist you through the game. My personal favourite was the Spiral Spear, which deals a huge amount of posture damage, and when combined with the Shinobi Tool skill allows a follow-up attack that would bring most enemies’ posture to the red immediately. Another favourite tool of mine is the Mist Raven, which basically acts as a fancy dodge, going as far as putting you behind the enemy for a counter-attack after successful use. The Shinobi Tools are a great little addition to a very fluid and calculated combat system. They allow for some form of experimentation, which is nice, but they cannot be used as a crutch. FromSoftware’s artists have always had a knack at creating visually striking environments (just look at Irithyll of the Boreal Valley from Dark Souls III or the city of Yharnam in Bloodborne), and Sekiro is no exception. Right out of the gate the game treats you to a gorgeous view of the Ashina Reservoir (once you make it out of the starting point) and then gives you the pleasure of viewing an indescribably beautiful field where you have your first real boss encounter. FromSoft’s artists have knocked it out of the park yet again, showing that you don’t need the highest resolution textures to convey a world of beauty and despair. One of my favourite designs in the entire game is the Great Ape, I won’t say too much about it but when you see you will understand why I find it so incredible. Sound design is also one of FromSoft’s strongest facets when it comes to games. I still think about the incredible atmosphere and sound that was in Bloodborne, and Sekiro does just as good a job. The crisp sound of blocking and deflecting hits where sword meets sword is one of the most satisfying sounds I’ve experienced in gaming (that’s including the glorious headshot sound from The Division). The crackling of flames, the snarling of dogs, the screech of otherworldly beings, it’s all incredible and gives off a vibe that the world beckons you but also wants to kill you. The only faults that Sekiro really has are fairly minor, but can feel pretty big when encountered. Firstly, the loading screens can be a bit long. Not anywhere near as long as Bloodborne or Anthem’s loading screens, but it’s a decent wait. Having to go back and forth between NPCs to progress the story can be a bit annoying, though this is something that only really comes into effect towards the second half of the game. Also some boss arenas, while really cool, can actively work against you, which is not what you want from a boss area. This last point is made even worse when you factor in Sekiro’s less-than-stellar camera. If you get put up against a wall, you lose all sense of where your target is and it is very easy to cop hits for this reason. Be wary of walls. Sekiro: Shadows Die Twice is an incredible game that was crafted from the ashes of a Tenchu reboot. It offers an engaging story, superb gameplay, challenging combat, an amazing world, great audio and visuals, stellar design and just an all-round top-tier experience that is only slightly sullied by a few issues like the bad camera and some disappointing boss areas. I would highly recommend picking this one up, especially if you’re willing to go through the steep-but-fair learning curve to experience the wonder and awe that is FromSoftware’s newest baby, and what I could potentially call my game of the year (even this early on).